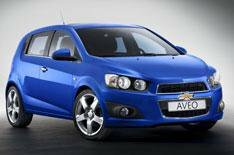 Chevrolet unveils Aveo supermini | What Car? Chevrolet has revealed the production version of its new five-door Aveo supermini. On sale in the UK next autumn, it follows two sporty RS concept versions that were shown earlier in the year at the Detroit and Geneva motor shows. At first glance the Aveo might look like a three-door car because the handles for the rear doors are hidden in the C-pillars. Two petrol and two diesel engines will be available from launch. The 1.2-litre petrol develops 85bhp while the 1.4-litre has 99bhp and will be available with a six-speed automatic transmission for the first time. The 1.3-litre diesel delivers either 74bhp or 95bhp and will have engine stop-start technology to improve economy. Chevrolet promises lively handling for the car, which, it says, has been fine-tuned to cater for European tastes.